TEL AVIV, Jun 24 2013 (IPS) - Tesfahiwet Medin holds a university degree and experience as a nurse. 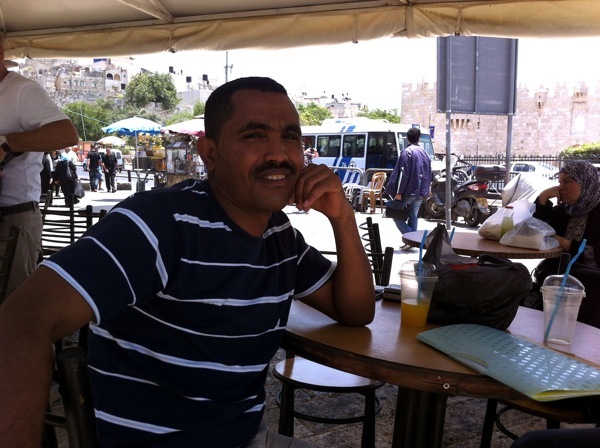 But six years after escaping the violent dictatorship in his native Eritrea, the 39-year-old says he feels like a part of him is missing, as he’s been prevented from continuing in his profession in Israel. Medin graduated with a diploma in nursing from Asmara University in 2006, specialising in prenatal care. A year later, he escaped from Eritrea and moved between Sudan, Libya and Egypt before arriving in Israel in 2010. He spent 15 days in prison upon entering Israel before being dropped in Tel Aviv with no money, no knowledge of Hebrew, and only the clothes on his back. After struggling to find a place to live and finding only manual labour for work, Medin quickly turned to the black market. "A lot of these people are well educated or have experience running a business, and they could be very beneficial to Israeli society." With the help of a local employment agency, he was finally hired to assist over 100 elderly Israelis living in a retirement home in Hod Hasharon, just north of Tel Aviv. His employer pays the agency his salary, and the agency relays the money to him, after taking a small cut for their services. It’s all under the table, Medin told IPS. Despite his vast experience, he said that the Israeli government bars him from taking the nurses licencing exam because he doesn’t hold a valid work permit. Today, Medin works an average of 300 hours per month, he said, and makes no more than 5,000 NIS (1,374 U.S. dollars). Israel is a signatory to the 1951 United Nations Refugee Convention, which sets out refugees’ rights and states’ responsibilities towards them. Nevertheless, Israel has not yet formulated a clear policy to determine refugee status. It doesn’t officially process refugee claims and has recognised fewer than 200 asylum seekers as refugees since its creation in 1948. Today, the United Nations’ refugee agency estimates that just over 54,000 refugees and asylum seekers live in Israel, with the majority coming from Sudan and Eritrea. Because their refugee status is never formally verified, most refugees in Israel hold a “conditional release” visa, which must be renewed every three months and does not allow them to work. The Israeli High Court ruled in 2011 that employers in Israel would not be fined, or charged, for employing asylum seekers holding a conditional release visa. While the decision effectively allows asylum seekers to work legally in the country, many employers remain hesitant to hire them. Last year, the Israeli government threatened to fine business owners and mayors of municipalities that employ African refugees. Earlier this month, Israel passed a law severely limiting how much money asylum seekers could withdraw from bank accounts while in Israel and how much money or property can be transferred abroad. The law now makes it almost impossible for refugees to support relatives in their home countries. As a result of employment restrictions, African asylum seekers are often forced to work in the informal sector, where they don’t have social protection or insurance, receive low wages for long hours and are vulnerable to exploitation. “[A refugee] doesn’t have family here. He doesn’t have community support. He doesn’t have any money from the government. He has nothing. So he’s ready to work 15 hours a day,” explained Orit Marom, advocacy coordinator at the Aid Organisation for Refugees and Asylum-seekers in Israel (ASSAF). Marom told IPS that Israel’s restrictions are motivated by the government’s hope that strict conditions, which include a policy of imprisoning asylum seekers for at least three years for entering the country illegally, will deter others from coming to Israel. It has constructed a fence along its southern border with Egypt and the world’s largest refugee detention centre for the same purposes. Even asylum seekers that have succeeded in opening businesses in Israel – mainly clothing stores, restaurants or cafes – face pressure. Last month, Ministry of Health inspectors poured bleach on food and confiscated meat at several refugee-run restaurants in South Tel Aviv after the establishments allegedly failed to meet health standards. “Rather than saying, ‘This is what you need to do,’ they destroyed all food in the restaurant, including what was on peoples’ plates,” explained Ilana Pinshaw, project manager at Tel Aviv-based microfinance group Microfy, which monitored the case and provides training, mentorships and small loans to asylum seekers in Israel looking to start businesses. A recent opinion poll conducted by the Centre for International Migration and Integration (a group funded by the American Jewish Joint Distribution Committee) reported that about 60 percent of Israelis believe that African refugees pose a danger to Israeli society. Almost 70 percent of survey respondents also felt that refugees are a burden on the Israeli economy, while 54 percent said they take jobs from Israelis. According to Tesfahiwet Medin, nothing – including harsh restrictions on work – will deter refugees from coming to Israel if they are fleeing war and persecution in their home countries. The solution to the current hardships asylum seekers face, he said, lies instead with pressuring Israel to examine refugee status claims. Terms and Conditions which will include the agreement.